In Part 1 of this blog series, we took a step back to set the foundation for how SAP is cutting the tension between IoT and ERP. Now, let’s focus on the present and what lies ahead for the intelligent enterprise. Like nerves in your body that send and receive information from your brain, SAP Leonardo services interact with your Digital Core to enhance, accelerate or automate your business processes. They get inputs from the central system and other sources to perform the tasks they are designed for, and send back the results to automate or enhance the central core processes. You can go beyond traditional transactions and drive digitized, automated operations based on a single source of information from planning, execution, prediction, simulation to analysis all in real-time. This powerful combination delivers new possibilities for enhancing your core business processes with a first wave of intelligent applications. CFOs and Finance Shared Service Organizations have to constantly reduce the costs of their operations and be able to scale without additional headcount. The SAP Cash Application automates a labor-intense, manual activity and thereby helps Shared Service Organizations to meet their objectives. Using SAP Leonardo Machine Learning capabilities, the SAP Cash Application software automates the process of matching bank statement items and invoices. It learns from accountants’ past manual actions, and from customer-and country-specific behavior, all without the costs of manually defining detailed rules. Using SAP S/4HANA, new incoming payments and open invoice information is passed to the SAP Cloud Platform-based matching engine, and proposed matches are either automatically cleared or suggested for review by accounts receivable. Not only does the solution reduce costs, it furthermore increases efficiency and reduces errors in the finance department through automation. It helps to reduce DSO, by processing incoming payments faster to increase liquidity and improve customer service. And finally, cost of ownership and maintenance efforts are minimized as the application continuously learns from human behavior and its changes over time, without any need of configuration or rules adjustment. Learn how a large chemical company is able to drive automation in accounts receivable, simplify processes and reduce TCO with the SAP Cash Application by clicking here. Alpiq, a leading Swiss energy company, is already looking at 92% automation rates – enabling their internal resources to extend their job scope and cover a broader area of responsibility. SAP Remittance Advice is another fantastic example of the synergistic benefits that can be realized with S/4HANA + SAP Leonardo. Remittance advice is an important source of information to match customer payments to invoices. Currently, shared service center employees are investing a lot of manual efforts when processing remittance information that their customers are sending to provide additional information for payments. The Remittance Advice extractor leverages SAP Leonardo Machine Learning to drastically lower manual efforts by automatically extracting additional information about payments from unstructured advice (email, PDF, paper, etc. ), and use it to automate the clearing process. It learns from historical data to improve the quality of the payment advice scan. The relevant extracted information is made available to SAP S/4HANA for further automatic processing, like the SAP Cash Application. This allows customers to allot significant resources to more strategic, value based activities. And finally, one of my favorite customer examples showcasing the power of “And” – learn about Trenitalia, the leading Italian rail operator and how they are completely cutting the tension between IoT and ERP. They are now analyzing data coming from thousands of sensors aboard their trains in real-time, helping them improve maintenance processes and ultimately offer better customer service. 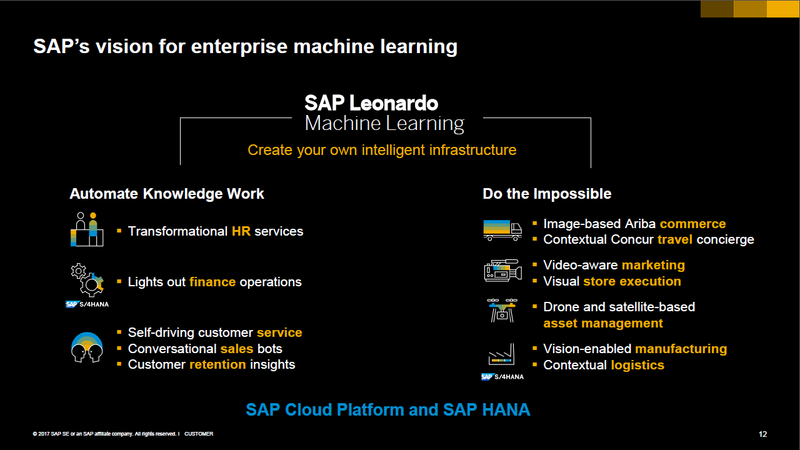 The possibilities are now endless, as you can see below from SAP’s vision of enterprise machine learning. As some of these examples demonstrate, we will shift from intelligent enterprises to more automated and autonomous entities in the not-so-distant future. We are already starting to hear about incredible use cases across many industries. For example, in the Dairy (Cattle) Consumer Products sub-industry, imagine the ability to analyze cattle and predict when they become ill. This can be addressed by Machine Learning and video technology by analyzing how the cattle walk. Incredibly, they give off cues when starting to get ill that you may not see unless you have continuous monitoring in place. This technology can ensure proper treatment to maximize production – yielding drastic top line and bottom line benefits including enhanced customer service levels. Sticking with Consumer Products, many companies in the produce business are starting to think about machine learning to automatically remove poor quality items from the production line. Given the high volume levels these companies are dealing with, this typically is a very manual and time consuming effort by many individuals. As Michael Dell recently said, “Ideas are commodities. Execution isn’t.” Just over a month ago, SAP announced its 1,000th live S/4HANA customer. By putting the customer at the center, SAP’s platform strategy and simplification story enable customers to run a live business. With S/4HANA as your digital core, you will undoubtedly cut the tension between your core and edge / innovation scenarios by providing immediacy, seamless integration and unmatched intelligence – driving competitive differentiation across your enterprise. SAP can help you define your digital business vision today. For more information, contact your SAP representative or visit: http://www.saps4hanahub.com/next-steps.